Let's start with what traditional Carne Asada is. In Latin America the word means grilled meat - specifically beef and usually marinated - with searing to give it a charred flavour. It can be used as a main dish on its own or in dishes such as - alambres, burrito, carne asada fries, gorditas, guaraches, nachos, quesadillas, sopes, tacos and tortas. I was intrigued one day to run across a crockpot version by Kelly Senyei of Just a Taste. Here she seared the beef first, then added to the crockpot with seasonings and beer. After cooking, she let the meat rest for 15 minutes, then cut it into strips and used it to make nachos. As with all recipes, you need to look at what works for you and what doesn't. Most are really just a starting point on the road to making it your own. seared the meat first for extra flavour. But time was of the essence this day - so I went as simple as possible. The other change was I used fresh onion and garlic instead of dried powders (not a fan). Here is my version with changes. This is a much larger recipe in terms of the amount of meat as I had a large crowd coming and also wanted leftovers for the next day to make a Tamale Pie. I also offer three ways to deal with the meat - putting it straight into the crockpot or searing on the BBQ or in a pan first. Choose the option that works best for you. And check back! Once I have all the recipes up as separate posts - I'll be writing an article on how to make a taco bar that serves a large crowd. You can deliver 12 - 18 at a time depending how many racks you have in your oven. 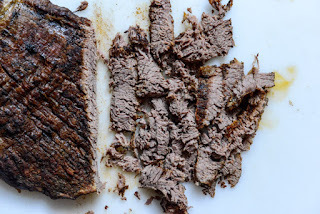 Cut Flank steak across the grain into 2-3 inch strips. From here there are 3 ways to continue. 1A. Easiest! 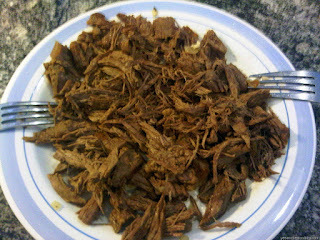 - Add the flank strips to the crockpot as is along with a tablespoon of oil and the rest of the ingredients. 1B. Sear the flank strips on your barbeque. Add to crock pot along a tablespoon of oil and the rest of the ingredients. 1C. Heat a small amount of oil in a frying pan. Sear the flank strips in small batches. Add browned strips to the crockpot. Add the beer to the pan and scrap up all the flavourful bits. Pour into the crockpot. Add the rest of the ingredients. Cook on low 6 hours. Using 2 forks, shred the meat right in the crockpot - do not remove the accumulated juices. I would save the meat (and reheat if made ahead of time) in the liquid and drain just before serving leaving just enough to keep the meat moist. Alternately you could drain the juice off after the meat is done and reduce on the stove to intensify the flavour - then add back in just enough to keep the meat moist.